Famous for its beaches, its fascinating culture, its ancient sites and temples, and of course its cuisine – Thailand has much to offer the volunteer traveler. Thailand, the land of smiles, is bordered by Cambodia, Laos, Malaysia, and Myanmar (Burma). Thailand is roughly the size of Spain and it is typically tropical and humid. 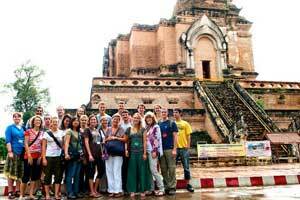 We have programs available in both Chiang Mai in the north of the country and Bangkok in the center. Chiang Mai is a popular tourist destination, encircled by mountains, lush rice fields, and natural forests. The city is considered the cultural and physical capital of (what used to be) the northern Thai (Lanna) kingdom. Chiang Mai is the home of an international airport, restaurants of almost every cuisine, incredible shopping and world class hospitals. It has long been a favorite of travelers. Although it is more laid back and traditional than Bangkok, this is still Thailand’s second largest city. It is also in the heart of the “Golden Triangle,” a beautiful and culturally rich region. The weather in most of Thailand is hot and steamy, but Chiang Mai offers some relief. Though seasonally it can get very hot, there are also milder periods, especially December and January. Projects are available throughout the year. 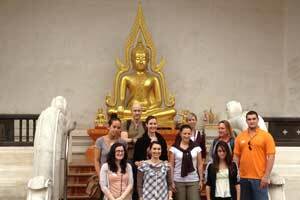 ELI Abroad offers programs in Bangkok and Chiang Mai, with an option to also work in both cities. No matter which site you pick, we offer safe and economical group housing, airport pick up, orientation and 24/7 in-country support. The main difference between the two locations is size and atmosphere. Bangkok is a huge, bustling city, and one of the most important urban centers in Asia. It’s crowded, exhilarating and unforgettable, a city of temples, museums, a pulsating nightlife and world-class food. When you volunteer in Bangkok, you gain a rare insight into the everyday lives of its residents, and enjoy an opportunity to become part of a community rarely seen or experienced through tourism alone. In comparison to Bangkok, Chiang Mai seems downright mellow, even though it’s the largest city in Northern Thailand and a significant cultural center that draws visitors from all over the world. The nearby hill country offers countless adventures, everything from river rafting and trekking to visiting exotic semi-independent tribal villages. Whether you want to volunteer in Thailand or enhance your resume with a professionally oriented internship, ELI Abroad can organize an exciting, reasonably-priced adventure in either Bangkok or Chiang Mai (or in both!) that’s likely to become your trip of a lifetime. Eli volunteers work with a few children’s homes based in and around Chiang Mai. They range in age from 6-16. The orphanages are run by a few local families, and in general don’t have much money. These places would have a hard time functioning without volunteers. Volunteers help out when the youngsters get back from school - around 4pm- Monday-Friday. They help cook, clean, play sports and games, teach arts and crafts and help out with homework. Volunteers usually eat with the kids, and help out with bedtime, if necessary; their day usually ends around 8:30 pm. This is an ideal program for upbeat, energetic volunteers interested in mentoring some of the poorest members of Thai society. 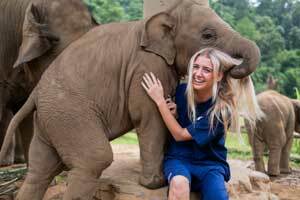 • To provide a safe, caring environment for rescued elephants. • To increase the number of Asian elephants through the breeding program. • To provide elephant and habitat conservation education. • To provide educational scholarships for disadvantaged Hill Tribe youth. • To assist with reforestation efforts in the district. A medical internship in Chiang Mai puts you in one of several hospitals in the city and offers exciting opportunities to learn about the Thai medical system, tropical diseases and public health issues in a developing country. Students shadow doctors and assist staff 5-7 hours a day Monday through Friday, and successful interns are often invited to observe in the OR. This program is open to junior and senior pre-meds, nursing and medical students. Fourth year medical students and above are typically put into rounds. Evenings and weekends are free time, when you can relax in one of Chiang Mai’s many cafes, explore its famous markets, or plan excursions into the nearby hillside villages and tribes. In Bangkok, medical interns as well as nursing and physical therapy students are placed at the prestigious Thammasat University Hospital which is affiliated with Thammasat University, one of the best universities in Thailand. This is a huge, modern facility where ELI Abroad interns can shadow, learn from the hospital’s top doctors and accompany staff into the OR. Please note that Thammasat University Hospital is located outside of Bangkok; it takes 45 minutes to an hour to reach it by public transportation via the BTS Skytrain. A letter of recommendation is required from a professor in a relevant field of study. All medical interns must submit a completed application a minimum of 2 months before arrival in Thailand. 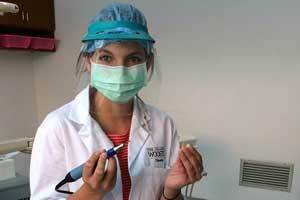 "I am a physical therapy student, and all I have been doing at the hospital is PT. They really paid attention to what I said. I'm mostly in the rehabilitation ward. I spent one day in out-patient. They worry about me getting bored, but I don't feel that way at all. The PT's are incredibly nice and seem very willing to learn from me as well as take the time to show me many things, even though they are incredibly busy. The patients are great, and I think part of the reason I like being in the same department every day is because I've gotten to know them a bit even though they don't speak any English. Most of them seem to love having me around, and they usually just ask me for help without words. I'm going to be very sad to leave them...They also have continuing education every Friday, which the director has asked me to attend. I also find that good. I think the fact that it's a learning hospital and that the director of the PT program specifically has a 5 year plan to make the program more internationally based has produced very good results. I also think staying in the same department is a good idea because you get to know the people so they care a bit more about helping you than if you were just in and out in a couple of days." A letter of recommendation is required from a professor in a relevant field of study. The minimum time commitment for health internships is 2 weeks. No second language required. Please note that for ALL dental placements: In order to maintain good relationships with the hospitals, ELI's policy is that once your internship is confirmed, the dates cannot be changed. Our volunteers teach novice Buddhist monks, middle school to high school age, at different monastery schools located in Chiang Mai and Bangkok. These teaching positions are a great way to learn about Buddhism and contribute in a meaningful way. The schools provide both religious and secular classes, with secondary education offered for boys who are unable to afford such opportunities. All the students are novice monks and many, but not all, of the faculty and administration are practicing Buddhist monks. In Chiang Mai, one of the schools has both novice monk students and non-monk students (however the majority are monks) separated by classroom. Many of the novice monks are orphans from the hill tribes, and some of them are learning Thai as a second language and English as a third. For volunteers who prefer working with older students, limited positions are also available for Teaching Assistants at the International University for Monks in Chiang Mai. Volunteers assist the professors in the English department with their lessons. Additionally, volunteers assist the students outside the classroom informally, practicing pronunciation, writing, conversation and other assignments and studies. There is the possibility of taking a more active role in planning lessons and writing exams. These additional tasks however, would only be offered to volunteers with experience and/or education in the field of university instruction. The Thai school year begins in mid-May and ends at the end of February. There is also a three week break in October. Therefore, blackout dates for our teaching projects are: March, April, the first half of May, and October. Enjoy the rare opportunity to intern with the top English-language magazine in Chiang Mai. This lifestyle publication includes coverage of the local cultural and civic events as well as special interest pieces. As in all magazine work, the hours vary based on assignment. Students who are at least rising juniors majoring in journalism or communications are welcome to apply. "I had a lot of opportunities, received a lot of great feedback, and a lot of encouragement. My boss, an amazing woman, was very welcoming and took me under her wing, so to speak. She helped with my writing, allowed me to shadow her interviews and became somewhat of a mentor. They were very open at Citylife, and let me do as much as I wanted, giving me opportunities I would never have had in the western press. In my second month, I was even allowed to take my own pictures [which were published.] Thanks to the internship, if you Google my name, you can see my work. I now have a portfolio – not very big, but it’s an important start." Most programs may last up to six months because of visa restrictions. Private rooms can be provided at additional cost. All ELI participants in Chiang Mai or in Bangkok live in the volunteer house. Bedrooms are shared when the house is at capacity, so be prepared to have lovely roommates. Only breakfast is provided at the volunteer houses. 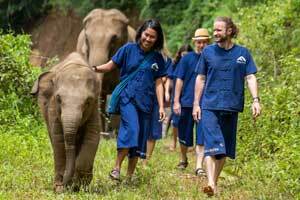 Elephant Camp volunteers stay Monday-Friday on site in small, charming huts onsite at the camp. Each has a basic bedroom and a small private bathroom. Three meals a day are provided at the camp, Monday through Friday. On weekends, when the camp is closed, volunteers can make side trips of their choice or go back to Chiang Mai, where there’s always plenty to see and do. Plan to arrive in Chiang Mai or Bangkok on one of these Fridays between 8am and 8pm. We cannot move you into our housing before an arrival date. 2019 Arrival Dates for Teaching Projects Only: January 4, 18, February 1, May 17, 31, June 14, 28, July 12, August 2, 16, 30, November 1, 15, 29, December 13. The Thai school year begins in mid-May and ends at the end of February. There is also a three week break in October. Therefore, blackout dates for our teaching projects are: March, April, the first half of May, and October. Arrival dates in Chiang Mai and Bangkok are not flexible, as mandatory group orientation starts bright and early on Saturday morning and runs through Sunday evening. The first day at your project will then be Monday. Medical/Dental Internships: Internship dates cannot be changed after the application is complete, as it negatively impacts the hospital and hospital staff. There are a lot of Public Holidays in Thailand, it is a festive country! Note that most projects will not have work for you over all of the holidays on this list. Be ready to take a break and perhaps partake in the festivities. Here is a handy tool to see what time it is in Thailand: Time Conversion Tool. Be sure to pack for the weather in Chiang Mai or Bangkok, and keep in mind that April tends to be the hottest month of the year. For immunizations, we defer to the recommendations from the Center for Disease Control. Learn a few Basic Thai Phrases before you arrive, you will frequently encounter language barriers - it's best to be prepared. Lastly, pick up a guide book - there is so much to see and do in Chiang Mai and Bangkok! All volunteers in projects where they work near or with children (all teaching projects, children's home and orphanage) must have a clean, certified police background check prior to their participation start date. This can be acquired from your local police station or online. Be sure to send us your police background check before you arrive in Thailand.